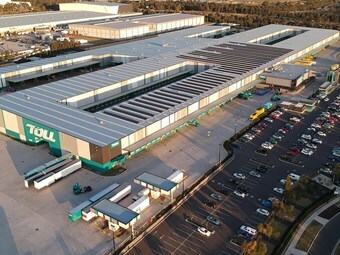 Its Toll Express Parcels Bungarribee depot, "one of the largest express freight depots in Australia in northwest Sydney", has had a 400kW, 1,485-panel rooftop solar system installed. The project was completed by energy services company NuGreen Solutions. Toll Global Express president Bruce Wilson says customers are interested in their environmental footprint and supply chain impacts. "This is a great example of Toll's proactive approach to managing carbon emissions, which has flow on effects to our customers," he says. Toll also recently introduced its "largest ever investment into the Bass Strait trade" in the form of two purpose-built, 700 twenty-foot equivalent unit (TEU) capacity ships called the Tasmanian Achiever II and Victorian Reliance II. The investment increases its previous capacity of 500-TEU ships and was built for the industries that rely on the link between Tasmania and mainland Australia. "The two new ships, which measure almost 210 metres long, 28 metres wide and will be able to carry 700TEU – 40 per cent more cargo than our existing ships," Toll says. "Together with major wharf and terminal upgrades in Burnie and Port Melbourne, these ships are part of Toll’s $311 million investment to boost the Bass Strait trade – the largest private investment in Australian coastal trading in 25 years."